Joby’s famous bendy-legged tripod can wrap itself around branches, posts and other handy bits of nearby scenery, but it’s just as useful as a flexible tripod you can bend and twist to fit any kind of terrain. It’s all achieved with the unique leg design, made up of a line of firm but flexible ball and socket joints which can be bent to any angle and then stay there until you bend them back. The new GorillaPod 3K Pro steps up to anodised aluminium construction to make the new model more durable, stronger and smoother. It also comes with a new BallHead 3K Pro head, with a separate panning movement and a numbered scale on the base for accurate 360 pans. The new head also has a 90-degree tilt movement and a full 360-degree pan, and has a small-scale Arca Swiss compatible quick release (QR) plate suited to the smaller footprint of today’s mirrorless cameras like those in our best cameras for vlogging guide. It’s designed with vloggers and content creators in mind and timed to meet higher demand for lightweight ‘travel’ supports that are quick and effective out in the wild. It's probably a bit heavy duty to make it on to our list of the best iPhone tripods and supports, but it's certainly an alternative in the best travel tripod category if you like to travel light and move fast. 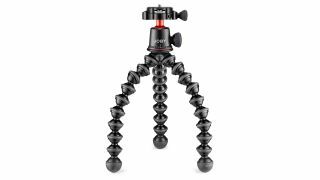 You can use the GorillaPod 3K Pro with or without the head to hold more than just cameras, including lights, microphones, monitors and other accessories up to the 3kg limit (3.3kg, to be exact. Hey, look at me! The GorillaPad 3K Pro Rig has extra arms for your video accessories. There’s even a GorillaPad 3K Pro Rig option which adds in a Hub Plate and GorillaPod arms to mount all the add-ons you need for your vlogging adventures. It also makes it look like some weird vlogging robot from the 1960s, which is arguably the best bit. The GorillaPod 3K Pro will be available from the summer of 2019 at prices yet to be confirmed.